Domer Home: Ring bearer's "Pillow"
After looking at traditional ring bearer pillows, I decided to do something a bit more natural. I know birds nests are typically a spring item but I still went with it because I liked the materials I found. Once again, I went to Hobby Lobby for my floral needs during a 1/2 off sale. The moss I found was so awesome... and soft! To start, I microwaved the moss for 30 seconds in a bowl to get rid of any lurking bugs. I took a handful of the moss and arranged it in the nest. 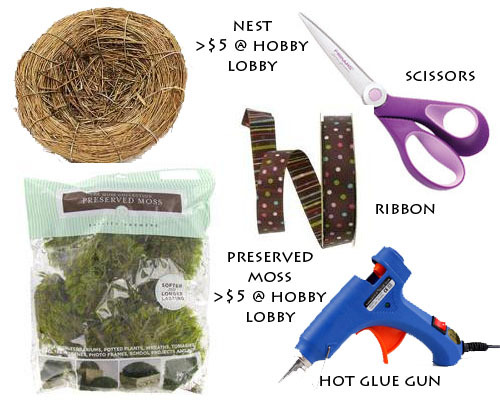 I carefully lifted up sections of the moss and put a couple dabs of hot glue underneath it to secure it. I tied a ribbon neatly around the nest as if I were wrapping a gift. I used a tiny bit of hot glue to adhere the ribbon to the nest. This project is so quick and easy to make! It took me only around 15 minutes to make! Now that the wedding is over, I put the nest on the shelf in our living room. Not only does it look great as a display item but it has so much meaning since it was used in our wedding!